Bought these bags for my store and they became one of my top selling bags. Thanks CEP couldn't have done it without your help. Love these transparent trade show bags. Got them from Custom Earth Promos at a very affordable bulk sale price point. Thank you. Very durable transparent trade show bag with a spacious amount of interior room. I've been using this company for almost 3 years now and absolutely love what they have to offer. This is my 3rd time re-ordering the same transparent bag in a bulk sale with Custom Earth Promos. They are a huge hit every time I bring them to a trade show with me. My husband really wanted me to order these for his business. We both loved the way they came out! We will be ordering more soon. My co-workers and I came up with a unique design to place on these bags. They really made a difference in the positive feedback we received, after the convention we attended. This has to be my favorite bag from Custom Earth Promos! You can use it for various outings! And at the same time promote your business! Great way to promote the company and make the world a better place. This is my #1 selling item in my store. I remain firm in the fact that purchasing eco-friendly products only enhances the quality of a business. Ive been working with Custom Earth Promos for quite some time and I am an example of this. Ordered 5k trade show bags this time and I am satisfied each and every time. Got my order today for my event this up coming week. My customized tradeshow bags are going to surely make the competition jealous. I'm absolutely thrilled at combination of the discount I received and the quality of my transparent trade show bags. I only promote "going green"
The logo on my transparent tradeshow bags really stood out. Gave these out at all the conventions I attend. My annual business nearly doubled and I directly attribute it to these recyclable tradeshow bags. They really are a fun way to advertise. What a unique product. At first I was apprehensive as to the transparency of the bag. I had a couple samples sent to me and I placed my order on the spot. Eco-Friendly and stylish. Customized my tradeshow bags with Custom Earth Promos. What a great company!! I received a remarkable discount on placing a bulk order. Customer service was a cut above the rest. Cory you really went the extra mile to give me a great deal on my customized bags. I appreciate all you did for me. When push comes to shove, you need a company that is genuinely concerned with your needs. Custom Earth Promos was very attentive. We put together a great idea. I placed my order for 10,000 eco-friendly transparent trade show bags and it was the best decision I could have made from beginning to end. Locked in my bulk order of transparent trade show bags. My designs look great on them. I get so much use out of my eco-friendly bags. Its nice to know they can be recycled and reused. It gives me piece of mind. Nice job putting this order together. I am another satisfied customer. I was able to combine an earth-friendly product that helped my merchandising. These bags were a great idea. With Custom Transparent Trade Show Bags by Custom Earth Promos as part of your advertising strategy, your business is well on its way to bright, bright sun shiny days. 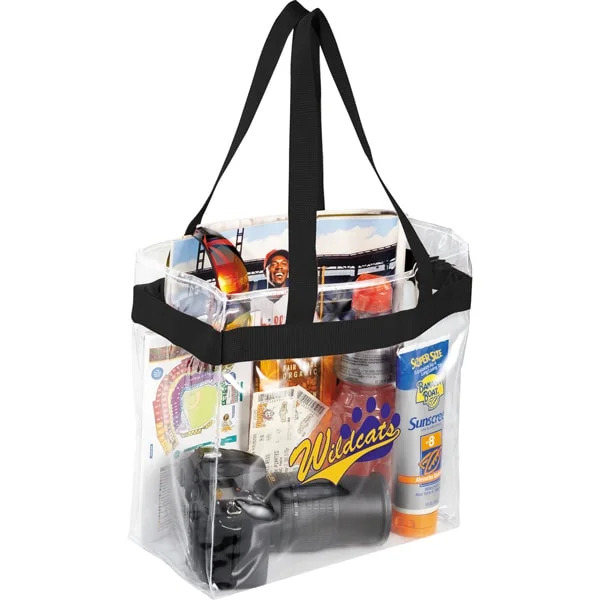 The clear vinyl tote is designed specifically to meet stadium restrictions and regulations with 8-gauge poly-vinyl material construction and a 12" W x 12" H size with 6" gussets. 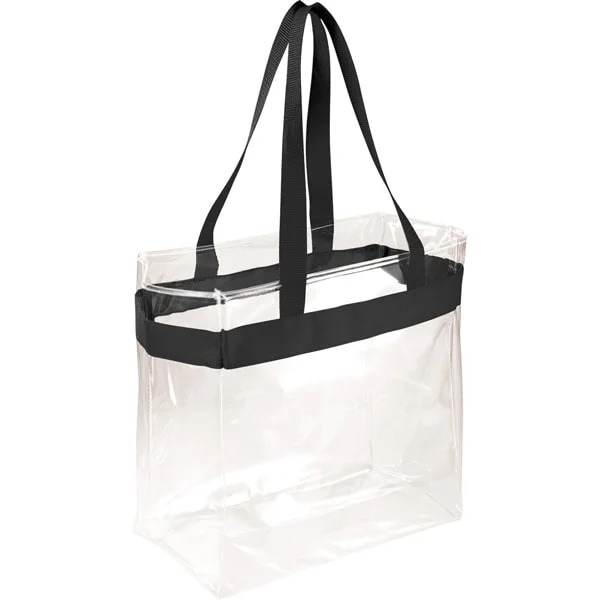 However, there are a vast number of additional ways to utilize and get the most out of this trendy, translucent little tote. A perfect choice for stadium days, sporting events, picnics, pool parties, field trips and more, this unique promotional product is a convenient little tool that also guarantees an increase in brand exposure and awareness for your business, charity or cause. The clear design is unique and eye-catching, sure to spark a conversation or two. Particularly when used for sporting events, where your logo would be seen by thousands of attendees in a single day, the potential for exposure is extraordinary with this reusable bag. A growing number of corporations and companies are choosing to use reusable and eco-friendly totes and trade show bags as promotional giveaways during corporate conventions, industry trade shows and as tactical gifts for loyal customers. There are multi-prong benefits to using this strategy. First, there’s the basic law of reciprocity. When a consumer is given a free gift, whether it be with purchase, for their birthday, to accompany a certain purchase or a plethora of other reasons, psychologically that consumer feels indebted to the company the gift was received from and are more likely to purchase from them in the future. Secondly, the brand loyalty that grows from brand admiration. Sure, the 6" W x 4" H imprint space on the Custom Transparent Trade Show Bags makes an excellent canvas to promote your brand on, but the eco-responsible nature of where you’re showcasing your brand is equally important. When consumers notice that the promotional gesture caters to an underlying environmental issue their trust in you grows stronger and brand loyalty increases as a direct result. It’s not just sports stadiums that have strict guidelines on the bags you can bring inside. It is becoming a common occurrence that quick security checks be taken of the handbag or backpack people are taking with them into everyday occasions like concerts, visits to the theme park, court rooms, the DMV, even many schools across the Country are requiring students to reveal the contents of their bag before entering and/or exiting. By providing your customers with this convenient clear tote for such outings, you’ll be saving them time and frustration by not having to empty their contents in a rush and potentially lose track of something important. They’ll also be reminded of how fond they are of your brand and their gratitude for your thoughtfulness every time they wear it, strengthening the loyalty they have to your brand. Each of these trips will also result in increased brand exposure, showcasing your business to a multitude of potential future customers! A variety of customization options are available to you should you want a different spin on your Custom Transparent Trade Show Bags. From adjusting the default dimensions to playing around with imprints, we have a whole range of customization options that will help to set your brand apart with an exclusive design all your own. In just a few short weeks, following your approval of the design blueprint, your wholesale order of custom trade show bags will be at your doorstep and we’ll be awaiting the phone call to hear how impressed you are with the final product and your excitement to start distributing them to your favorite customers, employees and industry connections.